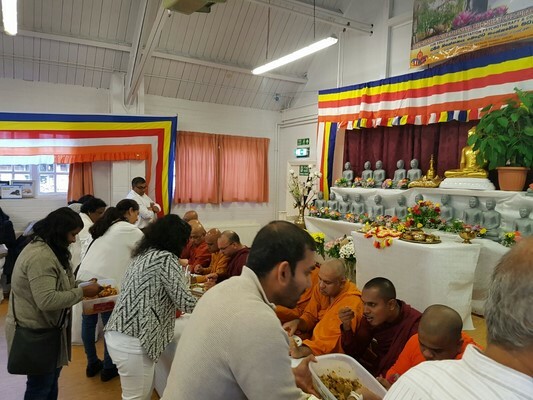 The Annual Kathina Ceremony of Letchworth Dhamma Nikethanaya Buddhist Cultural & Meditation Centre was held on Sunday 13th November 2016 at Brotherhood Hall. 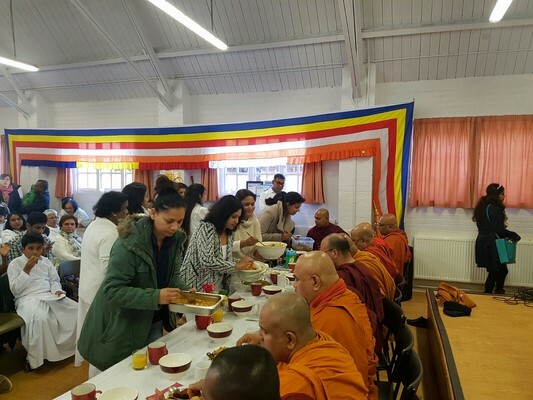 This was the 13th consecutive Kathina Ceremony or Community Day (Sangha Day) Celebration. 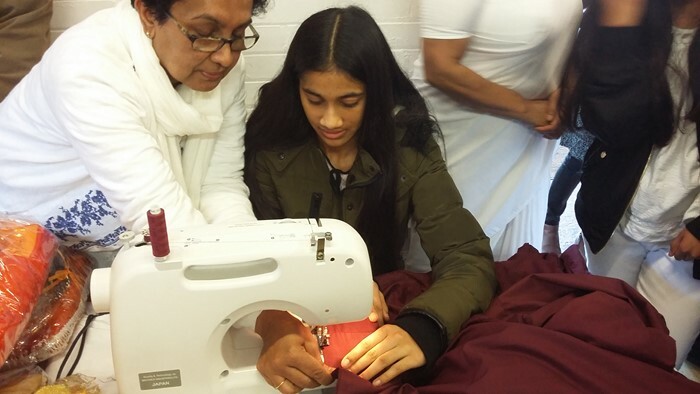 This year was mainly sponsored by Mr Jaswanth & Mrs Nirmala Sunda and children Asok, Isha & Manisha, together with all the members. 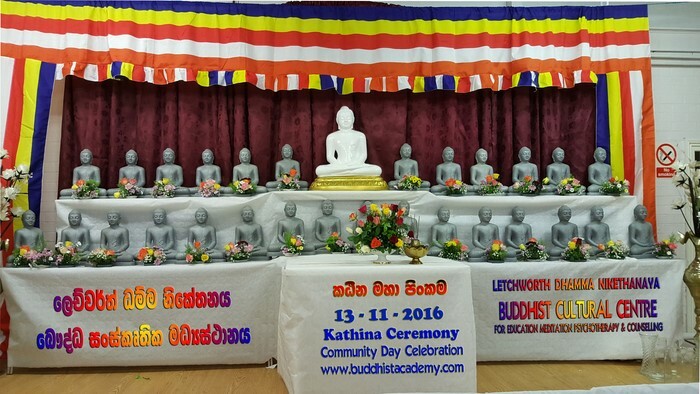 The Annual Kathina Ceremony of Letchworth Dhamma Nikethanaya Buddhist Cultural & Meditation Centre was held on Sunday 13th November 2016 at Brotherhood Hall in Letchworth Garden City. 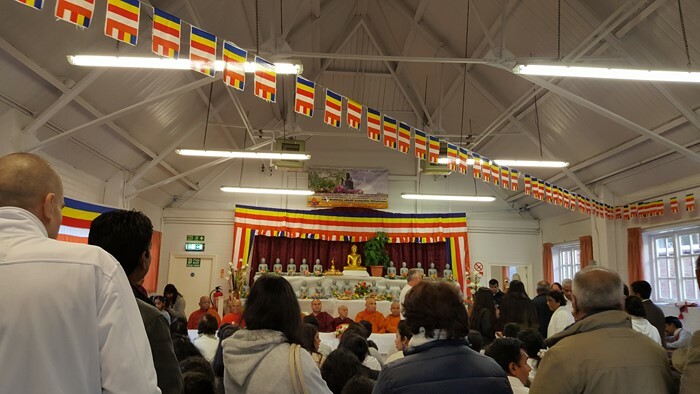 This was the 13th consecutive Kathina Ceremony or Community Day (Sangha Day) Celebration held by Letchworth Dhamma Nikethanaya Community. 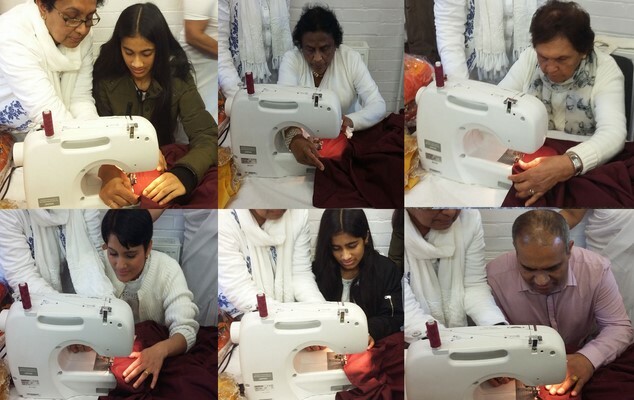 This year The Kathina Ceremony was mainly sponsored by Mr Jaswanth & Mrs Nirmala Sunda and children Asok, Isha & Manisha, together with all the members of the Letchworth Dhamma Nikethanaya Community. 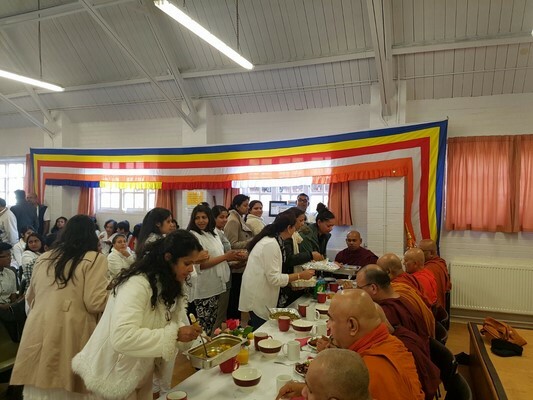 A large gathering of Venerable monks representing Buddhist Temples in UK graced the ceremony. 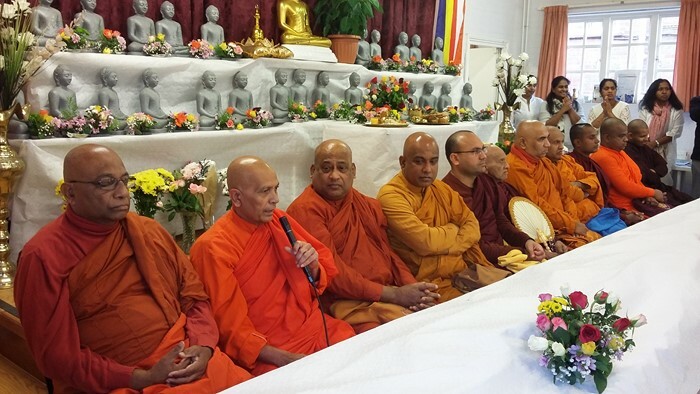 Over 300 hundred devotees, representing cosmopolitan member families of The Dhamma Nikethanaya Community, participated. The Kathina Ceremony is the highly meritorious and significantly blissful festival in the Buddhist tradition. 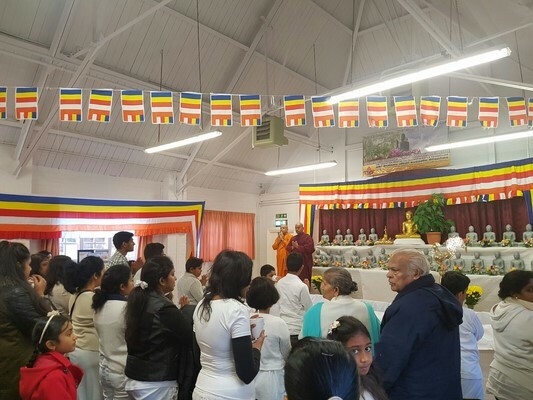 This Community Day Ceremony is held with the full participation of the community to mark the successful completion of the annual three months spiritual retreat observed by venerable monks residing at the monastery. 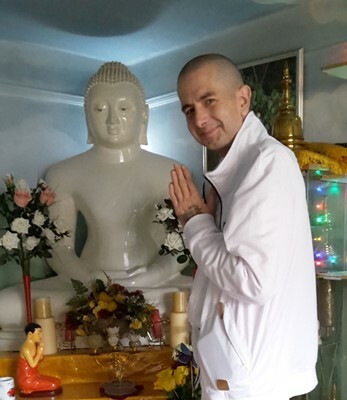 During this period of three months, the members of the community take special attention to devote more time and effort to practice Lord Buddha’s teaching as in Meditation, Dhamma studies, Dana Offering, Sila (Morality) Observations and blessings with Pooja chantings. Hence this three-month period is regarded as the highly blessed and most sacred spiritual season of the community. 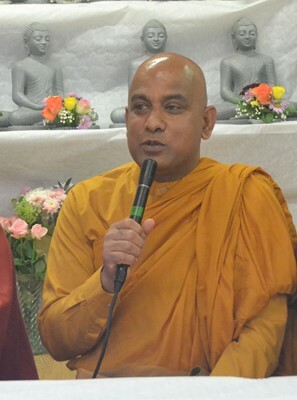 In accordance with the 26 centuries old unrestricted Buddhist traditional lineage, Venerable Monks headed by Most Venerable Akurala Samitha, Head of the Centre observed this year’s Three-Month Rainy Retreat on Esala Full Moon Day that fell on Saturday 17th July 2016 and successfully completed the three months on Vap Full Moon Day Which fell on Saturday 15th October 2016. Kathina Ceremony has to be held within the month from the completed full moon day to the subsequent full moon, that means before the next Full Moon Day that falls on Monday 14th November 2016. After this day this Ceremony cannot be held. 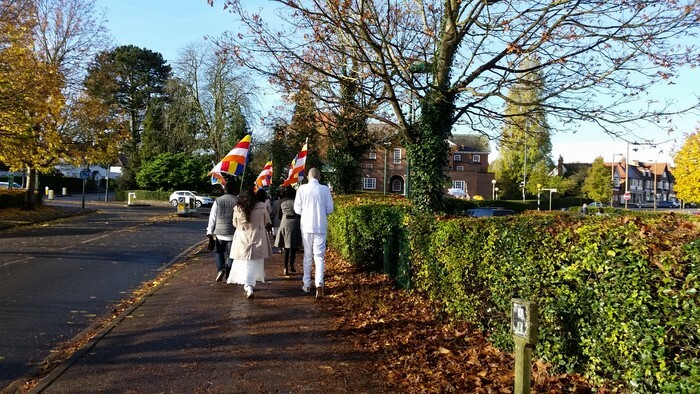 This year The Kathina Ceremony of Letchworth Dhamma Nikethanaya brought many multi cultural people together as one family. Everyone inspired the happy, peaceful and uplifting atmosphere of the ceremony. The local community admired the rare experience of attractively pious cultural activities related to the ceremony such as Kathina Procession. 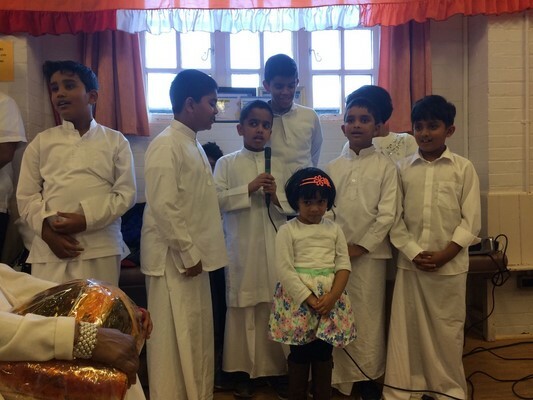 Children of the Dhamma School put lots of effort with overwhelming enthusiasm in participation. 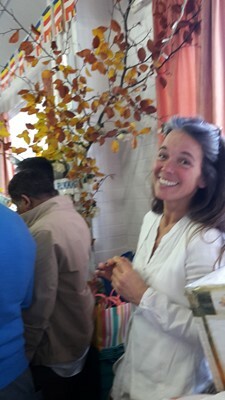 It was a very educational and joyful opportunity for them to experience the typical Buddhist Culture. 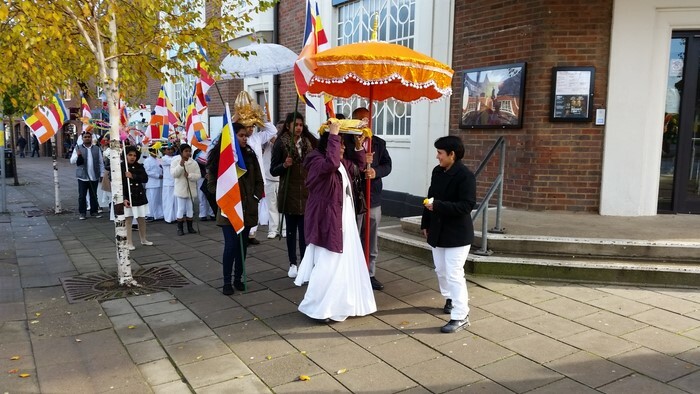 The Kathina Procession was beautiful as it was led by the children, carrying Buddhist flags and decorative items, with cultural drummers heralding the sacred relics of the Lord Buddha, with a sacred sapling of the original Bodhi Tree and the Kathina Robe. 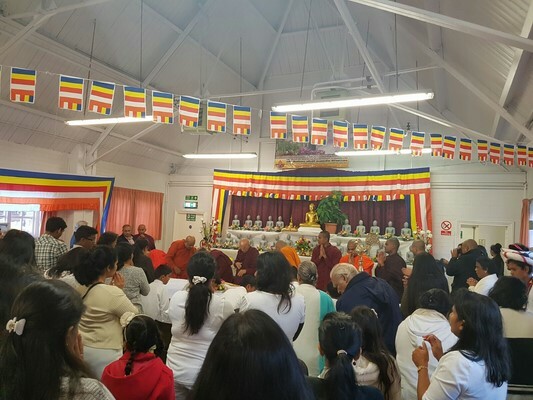 The ceremony was held in the graceful presence of over 13 Venerable Buddhist Monks representing leading Buddhist Temples in the United Kingdom. 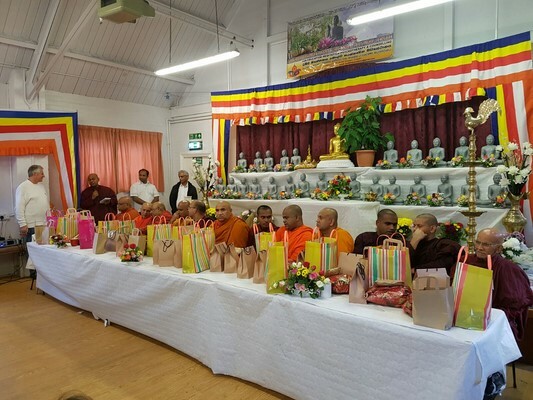 Among them were Most Venerable Dr Witharandeniye Kassapa Maha Thero OBE (Head Monk of Birmingham Buddhist Maha Vihara and Leicester Dharmasoka Buddhist Vihara), Most Venerable Dr Kabalewe Siri Sumana Maha Thero (East London Lumbini Buddhist Vihara), Most Venerable Dediyawela Wimala Maha Thero (Head Monk of Letchworth Buddhist Vihara), Most Venerable Makure Mangala Maha Thero (Head Monk of East London Lumbini Vihara), Most Venerable Gunnapane Sumanarama Maha Thero (Head Monk of Edmonton Samadhi Meditation Centre), Most Venerable Kushinagar Thejwanth Maha Thero (Head Monk of Wolverhampton Buddhist Vihara), Most Venerable Waskaduwe Subhodhi Thero (Kingsbury Temple), Venerable Galayaye Dhammaransi Thero (London Kingsbury Temple), Most Venerable Nugethenne Chandananda Maha Thero (East London Lumbini Buddhist Cultural Centre), Venerable Rathnapure Nandaloka Thero (Birmingham Buddhist Maha Vihara), Venerable Suriyawewa Wijithananda Thero (Letchworth Buddhist Vihara), Venerable Kelipanave Gnanaseeha Thero (Birmingham Buddhist Maha Vihara). 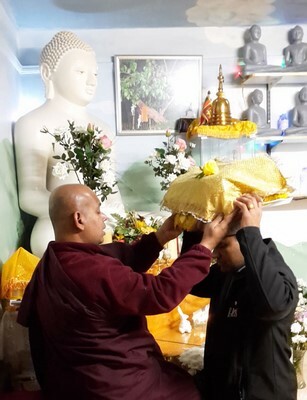 Most Venerable Dediyawela Wimala Maha Thero administered the five precepts to mark the beginning of the ceremony. 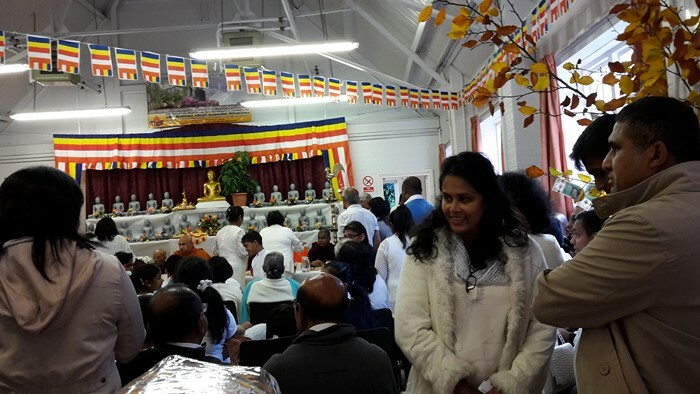 Most Venerable Dr Kabalewe Siri Sumana Maha Thero conducted the Kathina Dana dedication. 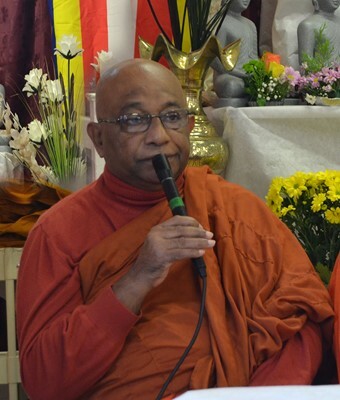 Most Venerable Dr Witharandeniye Kassapa Maha Thero delivered a Dhamma Talk in English explaining the significances of the traditional spiritual ceremony to the modern world, and highlighted the credentials of Venerable Akurala Samitha as a rare skilful monk from whom the community can be benefited immensely. 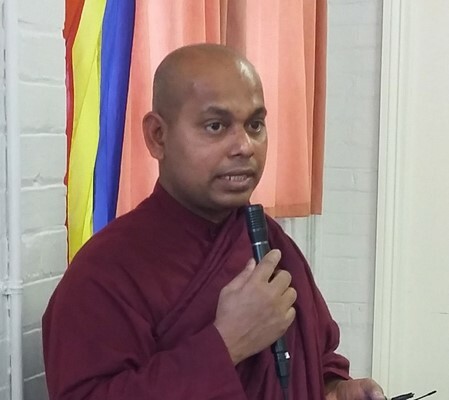 The Sinhala Dhamma Sermon was given by Most Venerable Makure Mangala Maha Thero. 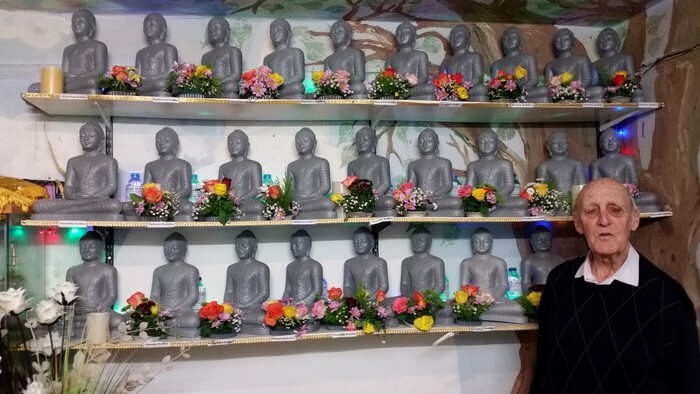 Most Venerable Kushinagar Thejwanth Maha Thero delivered a talk in Hindi. 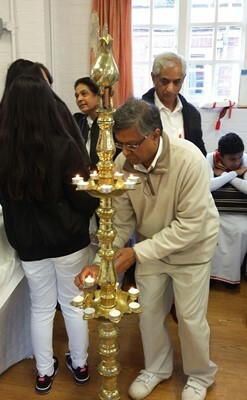 A Special Atavisi Buddha Pooja was held to invoke the merits and blessings to parents of all members of the community. 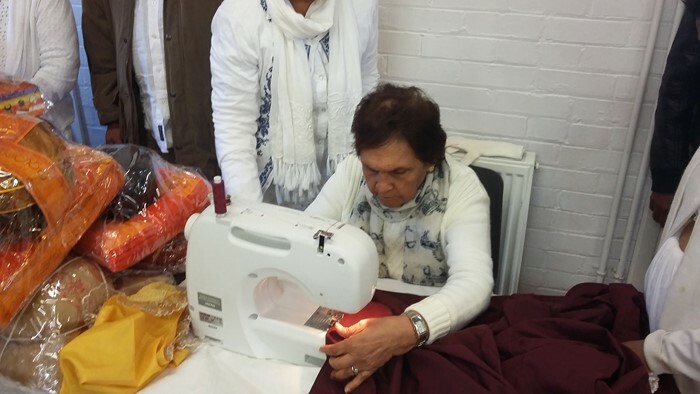 Late parents of the members of the community were dearly remembered by sharing the merits. 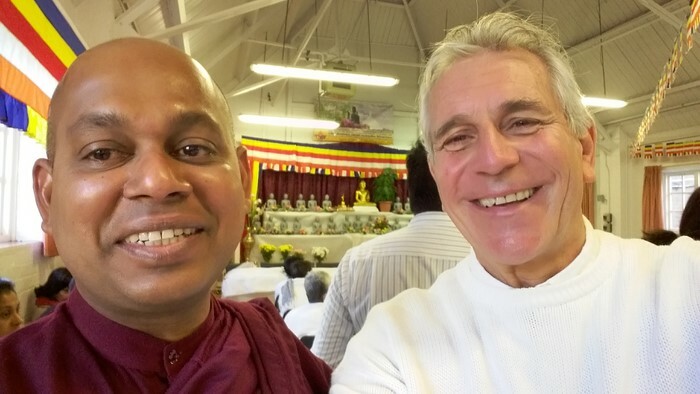 Atavisi Buddha Pooja was sponsored By Mr Neil and Nitha Gurusinghe together with their friends. 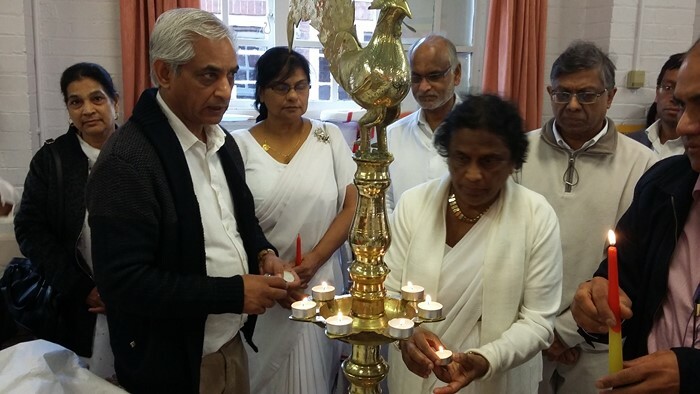 Flower offerings and the elegant floral pooja were sponsored by Mrs Pulani, Mrs Mahesha and their friends. 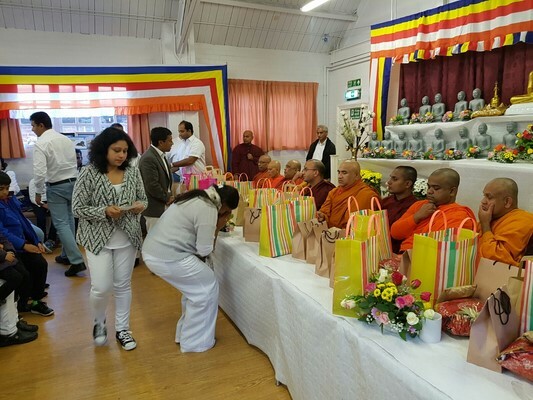 Hamper Gift Parcels to venerable Monks were sponsored by Mrs Yasa Amarasinghe. 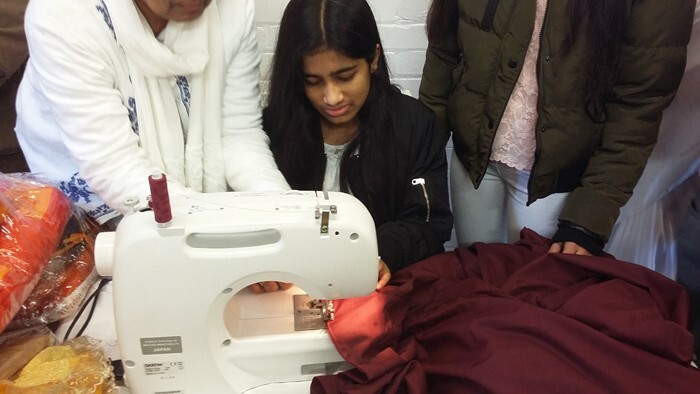 Hamper Requisites Parcels were sponsored by Mr Sunjeewa & Mrs Shashika Jayawardana. Healthy Fruit and Medicine Hamper Parcels were sponsored by Mr Sanjaya, Mrs Uthpala Dodangoda, Mr Chanka, Mrs Thilanka Herath, Mr Rajith & Mrs Arunodhi Disanayake and friends. 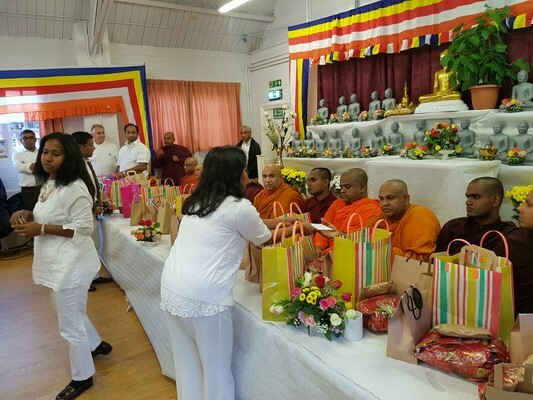 Gift Donations Offering to Venerable Monks were supported by all the members of the community with the main support of Mr Jasawanth, Mrs Nirmala Sunda, Mrs K F Hill, Mrs Kanthi De Silva, Dr Elliot Cohen, Mrs Kisha Chaudari, Mr & Mrs Sujeewa Lokuwaduge & Mr Priyantha & Mrs Kumuduni Uluvita. 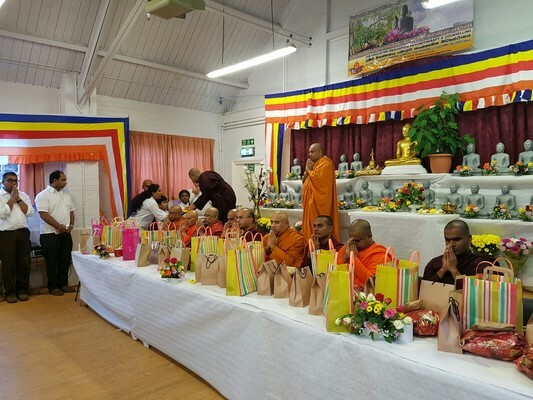 Members of the Thames Buddhist Vihara extended their support as usual in gratitude to the contributions of Venerable Akurala Samitha by attending the ceremony. 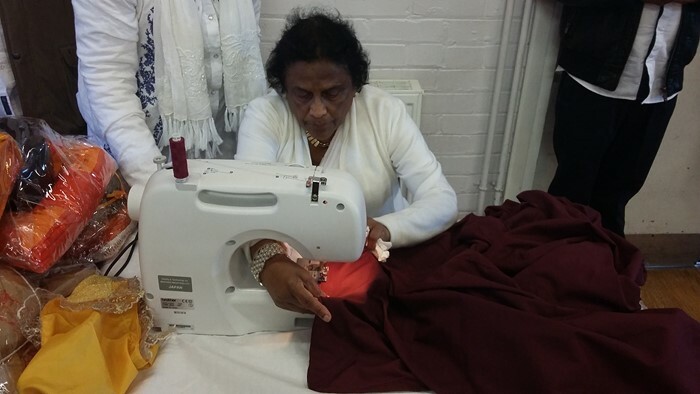 Mr Nihal Jayasinghe co-ordinated the support. 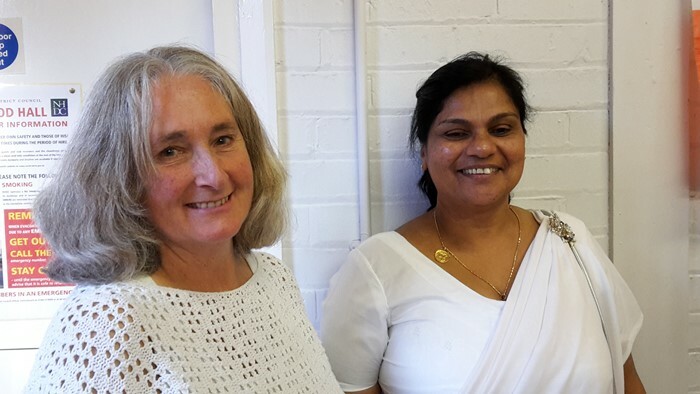 Mrs Renuka Amarasinghe and Mrs Shamani Wathsala attended with great support and coordinated the children with Kandyan Drumming in cultural and traditional costumes. Gayan Amarasinghe, Kevin Amarasinghe and Devan Pharmer brought extra delight to the ceremony with their skills and talents in traditional drumming. 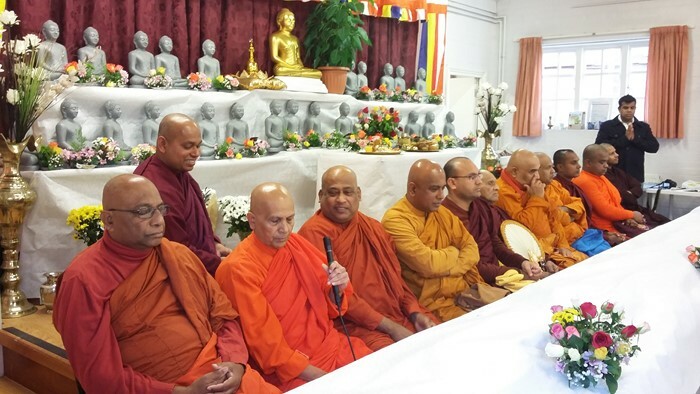 Venerable Akurala Samitha thanked everyone supported to make this year ceremony a great success. 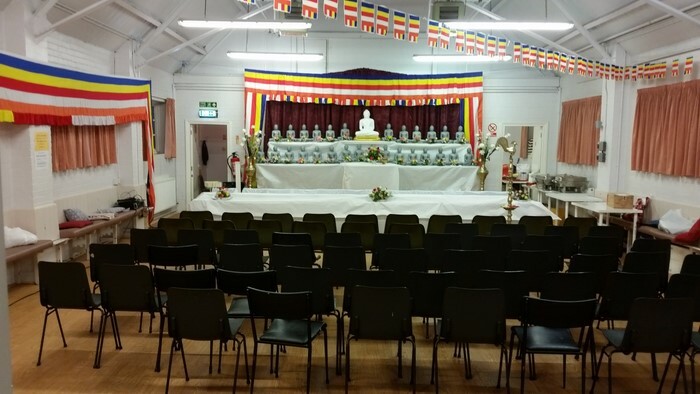 The Ceremony Hall arrangements and decorations were not possible without the earnest support of Mr Manor Summan, Mr Udena Wanniarachchi, Mr Connaire J Packer, Mr Anthony Varughese, Dr Thura Limbin, Mrs Rathnawalie Dep, Mr Rajitha & Mrs Seedevi Kuruppu and children Senaya and Kevin. 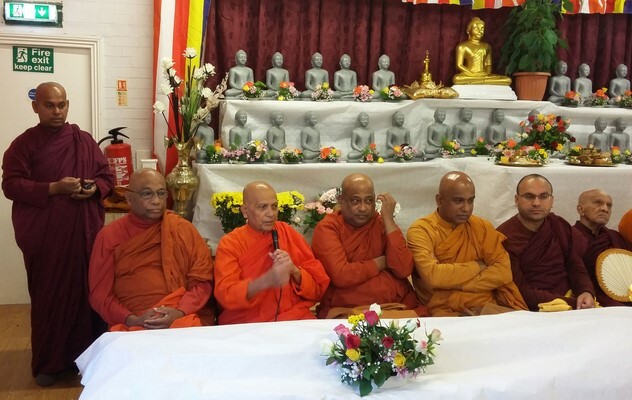 Venerable Samitha shared heartfelt gratitude and blessings with them all. Mrs Wasana Deepani Kariyawasam was greatly appreciated for her ardent support for organizing the children to learn and experience their typical culture by effectively engaging with the event. 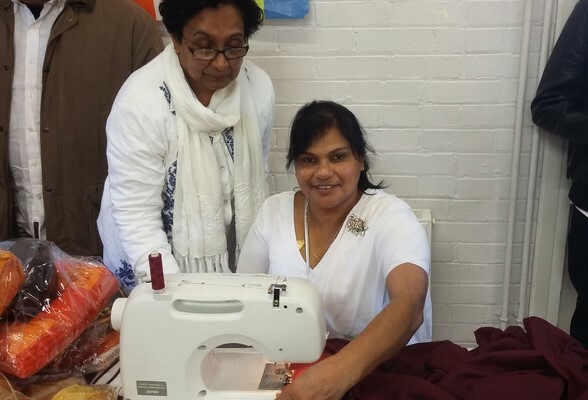 Mrs Samanthi De Silva and Mrs Asha Sooriyabandara were appreciated for supporting in preparing the event needs. 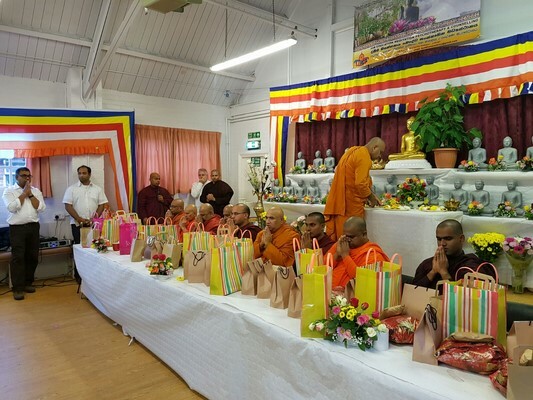 Venerable Akurala Samitha shared the blessings with those who offered Atapirikara, Robes, Monks’ gift items and other donations. Their support greatly counted for the success of the ceremony. May the Blessings of this greatest meritorious deed fulfil, without exception the aspirations of all, and lead to the everlasting happiness Nibbana! May all be secure, well and happy with Noble Blessings of the Triple Gem! Devotees Carrying the Kathina Robe in the procession. 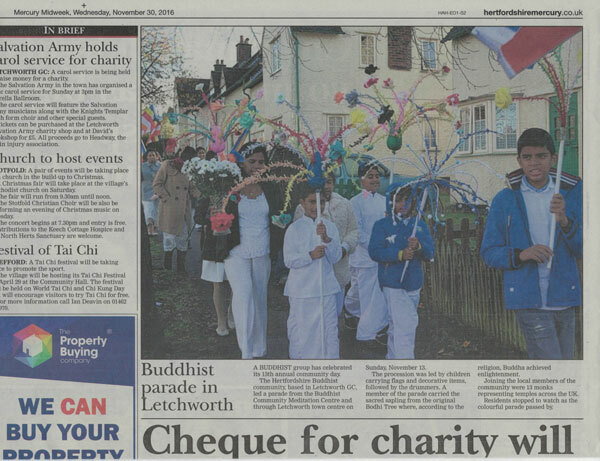 Dhamma School Children of Letchworth Dhamma joined the Kathina Procession with decorative Perahera Items. 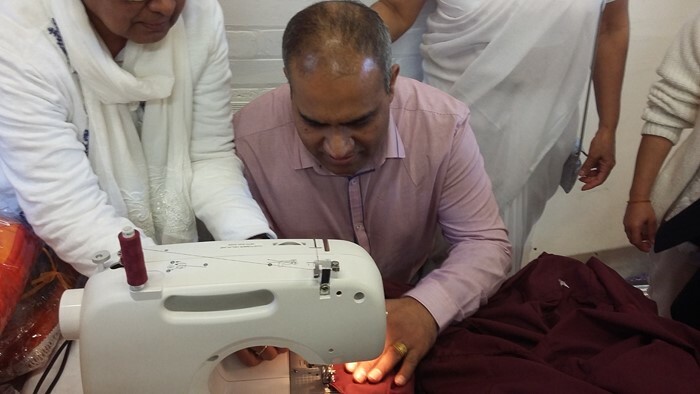 Venerable Monks Making a Special Vinaya Karma (Disciplinary action) to dedicate the Kathina Robe and transfer it to Venerable Samitha according to the Traditional lineage. 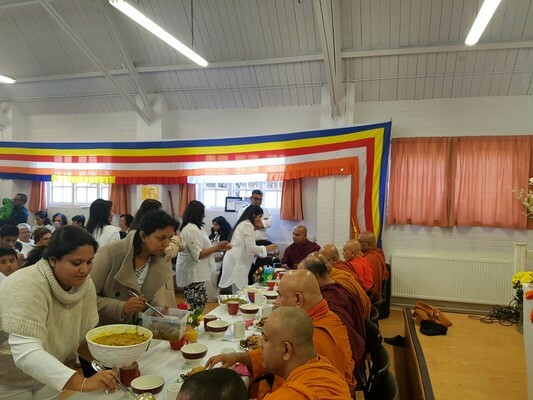 Venerable Akurala Samitha invoked the blessing and share the gratitude by thanking for helping in many ways for making the ceremony a huge success. 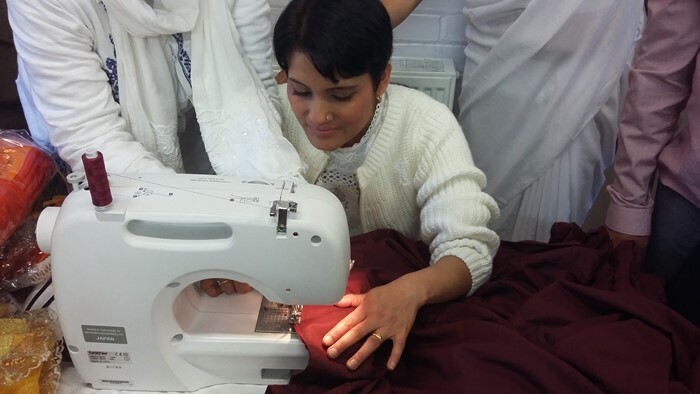 Letchworth Dhamma Nikethanaya Community is deeply touched with the overwhelming support and the spirit of all to make this year Kathina Ceremony a great success. May all share these strongest and noblest blessings.! May all be well and happy!